Designed for an exceptional family room entertainment experience, the Control4 EA-1 Entertainment and Automation Controller is more than automation for just the gear around your TV, it is the ideal smart home starter system with entertainment built in. The EA-1 is perfect for controlling all your entertainment devices in one room, along with your thermostat, door locks, and Smart Lighting. While the EA-1 can control one room of a larger Control4 system, it cannot be the primary controller in a multi-controller system. The Control4 EA-1 delivers a beautiful, intuitive, and responsive on-screen user interface with the ability to create and enhance the entertainment experience for any TV in the house. The EA-1 can orchestrate a wide range of entertainment devices comprising of Blu-ray players, satellite or cable boxes, game consoles, TVs, and virtually any product with infrared (IR) or serial (RS-232) control. It also features IP control for Apple TV, Roku, televisions, AVRs or other network connected devices, as well as secure wireless ZigBee control for lights, thermostats, smart locks, and more. For entertainment, the EA-1 also includes a built-in music server that allows you to listen to your own music library, stream from a variety of leading music services or from your AirPlay-enabled devices using Control4 ShairBridge technology. Advanced multi-core processor delivers a new level of speed and performance for instantaneous, interactive on-screen control and access to lighting, security, music and video solutions. Elegant, low-profile design features an integrated power supply for flexible, simple installation. Available mounting bracket allows easy mounting to the back of your TV, on the wall, or to a standard wall box. Incredibly fast, intuitive control from a touch screen, remote, or TV On-Screen Navigator. Certified HDMI, with audio and video capability, delivers an all-new, elegant on-screen experience with reliable connectivity to today’s televisions and receivers. Integrated music server with native support for popular streaming services. 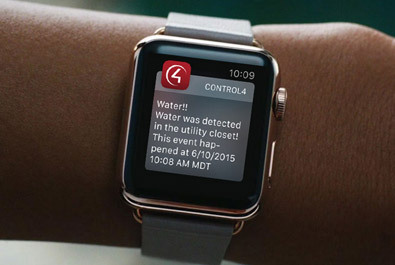 Control4 App license enables in-home control from multiple iOS devices including Apple Watch, and Android mobile devices. Connect to your home remotely with an optional 4Sight subscription.